We are pleased to announce $2,900 was raised by the ACDA and an additional £1,741 was raised by our sister UK registered charity, The David Ashwell Foundation, for a grand total of $5,016 in connection with Rare Disease Day on February 28, 2017!! Our sincerest thanks to the families, friends, colleagues and classmates of the ACDA and The David Ashwell Foundation for raising such an incredible amount for ACD research! In the U.S., we would like to give our very special thanks to Moore & Van Allen PLLC (Charlotte, NC), Family Design Resources (Harrisburg, PA), Little Treasures Learning Center (Grove City, PA), The Smithtown Library (Nesconset, NY), East Quogue Union Free School District (East Quogue, NY), Suffolk County District Attorney, Economic Crime Bureau (Hauppauge, NY), Suffolk County Attorney’s Office (Hauppauge, NY), Suffolk County Office for the Aging (Hauppauge, NY) and Children’s Choice Childcare, Inc. (Hauppauge, NY). In the UK, we would like to give our very special thanks to Brighton & Hove Albion FC, Moulscoomb primary school, Lewes priory school, Durham University (various schools & central services), Newcastle University Institute of Health & Society, Skerne Medical group, Runway East, Kirby Great Broughton school, Yarm primary and Unforgettable™. We would also like to thank all of our individual donors and anyone who wore #JeansForGenes or sent pictures wearing the ACDA logo! Thank you for your outstanding support of our ACDA families. Please see below for ways that our ACDA families and friends supported Rare Disease Day in 2017! Check out our ACDA families and friends wearing #JeansforGenes and the ACDA logo (note, you can use coupon code “STPADDY17” for 15% off your entire order March 3 – March 8, 2017 in the ACDA store)! Below are flyers for anyone to use at their workplace that encourages employees to donate $5 / £5 to the ACDA and wear jeans to work on February 28 as part of Rare Disease Day. 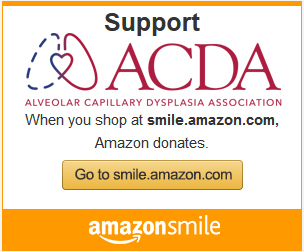 Several of our ACDA families asked their workplaces and schools to join this effort to raise awareness of ACDMPV! What does it mean to be rare? In the case of ACDMPV, it means you are one of only a few hundred children worldwide formally diagnosed with ACDMPV since first identified in 1948. By contrast, the U.S. National Institutes of Health (NIH) considers a disease rare if it has a prevalence of fewer than 200,000 affected individuals in the United States. Taking a moment to reflect on those numbers, you realize how rare ACDMPV is even within the subset of rare diseases. And yet, this very rare disease often feels a little less rare due to the compassion, generosity and support of our ACDA families and friends. On this Rare Disease Day 2017, we are stopping to thank our ACDA families and friends for listening, learning, sharing and always remembering our children who are no longer with us or faced uncertain futures due to this very rare disease. 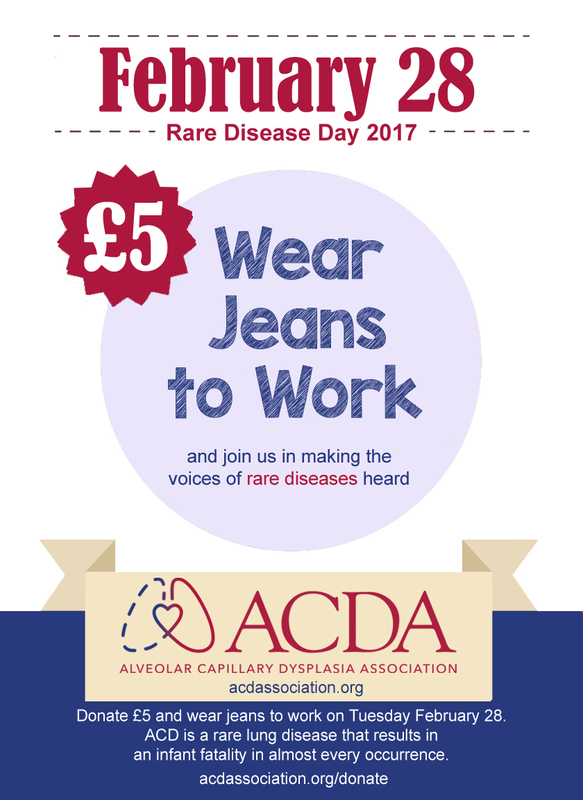 We thank everyone who has ever ‘Liked’ our Facebook page, wore #JeansforGenes, donated funds for ACDMPV research, dressed in a shirt with the ACDA logo, organized a fundraiser, used the designated hashtags #RareDiseaseDay #WRDD2017 or shared an ACDA link. We also thank anyone who has ever sent a hug or love on those difficult days, spoken our child’s name on an ongoing basis, held our hand through an anxious rainbow pregnancy or any of the other innumerable ways you have shown your support. Our list could go on forever in so many ways. If there is one glimmer of light in the reason that unfortunately brought all of us together, it is that the ACDA community itself is also rare. Not just because of the statistical numbers, but because our ACDA families and friends are unusually remarkable. Rare Disease Day is an international advocacy day to bring widespread recognition of rare diseases as a global health challenge. The day is celebrated on the last day of February every year – February 28 in 2017. The ACDA has signed on once again to partner with NORD to support this awareness campaign and we encourage everyone to participate in some way. Click HERE to see how the ACDA supported Rare Disease Day in 2016! Click HERE for ways to participate in the U.S. in 2017 and click HERE to visit the EURORDIS website for Rare Disease Day 2017 in Europe.